The virtual plant includes a number of embedded images -- THUMBNAILS of which are normally displayed.- DOUBLE CLICKING the thumbnail will access a high-resolution image, but not always identical to the thumbnail. The Virtual plant has an on-line glossary. Clicking on underlined words, will pop up a small reference window, with relevant text, and an image, if this is available. The pop-up boxes are elastic and resizable. Click on this example, to see what happens (click me). These popups are elastic and can be resized. Studying the following specimens should give you a good idea about the variation in vascular supply in plants. Remember, they represent a small selection only. Understanding evolutionary development of the vascular tissue in higher plants Identifying cells and tissues involved in formation of vascular systems. The development of the transport systems which could accommodate efficient water and carbohydrate transport, was one of the most important requirements for the evolution of an efficient land plant. Long-distance transport becomes a serious problem if inefficiencies exist in either system. Growing larger and taller would also not have been possible without the synthesis of lignin. Emergent land plants evolved over a very long time, with the first vascular land plants evolving during the Silurian about 440 million years ago. The first conifers evolved during the Permian (290-250 my); flowering plants during the late Cretaceous (70-65 my) and the first angiosperms during the late Tertiary. The first vascular plants had fairly primitive vascular systems - these were called protosteles fossil members of the Lycopodiales were at the height of their development and dominance during the Devonian and Carboniferous (408- 360 million years ago). The two examples that we have chosen to illustrate, have primitive vascular systems (Lycopodium claviatum and L. saururus illustrate examples of a fairly 'advanced' protostele, one in which the xylem and phloem has become dissected. We illustrate a fern (Rumohra) and then gymnosperms (Encephalartos, Araucaria, a member of the pines). Common amongst these is their vessel-less xylem. We have included a few examples of angiosperms which have eustelic vascular systems in their primary stems, (Cucurbit which has bicollateral vascular bundles, Nymphaea a hydrophyte with highly reduced xylem, and a Ligustrum species). Finally, we include Zea mays in which the atactostelic condition and dominant influence of the leaf vascular supply is most evident. Biology of Plants (6th or later edition) are highly recommended for additional background information. Vascularization was an essential step in the land migration, as well as the development of more efficient (but not necessarily larger) plants. This exercise examines some aspects of the evolution and development of the vascular systems in plants. We will look at some examples of hydrophytes, as well as some 'typical' land plants, which show variable structural features. Water plants (hydrophytes) generally have a very different structure from those that occupy the land niche. For example, hydrophytes do not need (nor have they) much in the way of mechanical supporting tissues. Hydrophytes also have a reduced vascular supply -this is evidenced in reduction of the water-conducting tissues within the xylem. Xerophytes on the other hand, generally have much-reduced diameter of tracheids and vessels, have fewer intercellular spaces and may have other physiologically important structures to regulate water and assimilate transport. Xylem vessels and tracheids connect to surrounding parenchymatous elements, through pit membranes, thus ensuring passageway for water and other dissolved organics and inorganics that need to be transported throughout the plant body. The Lycopodiales include two living genera -Lycopodium and Phyllglossum. There are fossil members, that were at their height of diversity during the Devonian and Carboniferous (408- 360 million years ago). These plants are commonly known as the club mosses. What is interesting with respect to transport of water and carbohydrates, is the great variability that we can see with respect to the arrangement of the vascular tissues in the stems. Click here for a detail of the vascular tissue in this species. The micrograph to the left, a cross section of Lycopodium claviatum, shows an example of a dissected protostele. This is recognized as primitive. To the right, Lycopodium saururus illustrates and example of a plectostele in which plate-like xylem strands are interspersed with the xylem. The phloem consists of sieve cells and albuminous cells. Interestingly, this structure is found to this day in all young dicotyledonous and monocotyledonous roots! Click here for a detail of the vascular tissue in this species. In Lycopodium claviatum, the central xylem core is more imposing, and looks like a series of finger-like projections. The phloem contains large-diameter sieve cells, surrounded by albuminous cells. This type of vascular arrangement is referred to as an actinostele, whilst the the central vascular core in Lycopodium saururus, is dissected and described as a plectostele (plate-like). The xylem in the outer regions in L claviatum suggest a more advanced anatomy, with strands visible, which are are triangular and alternate with phloem. This structure is very like that of some monocotyledonous roots today. 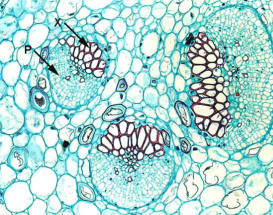 Examine the cross-section above, and make a drawing showing the distribution of the xylem and phloem in this species. Note the position of the endodermis and the pericycle. There are about 700 species within the genus Selaginella. The herbaceous. sporophyte of Selaginella is morphologically very similar to Lycopodium, but the stem anatomy differs markedly between these genera. This micrograph shows that the vascular tissue, which is suspended centrally, within a hollow stem by elongated cortical cells, called trabeculae. A trabeculum, (the single strand of brown-coloured cells) can be seen in this micrograph. Question: Can you think of a reason why this vascular system has this peculiar arrangement? This is a fairly common fern, often found in Botanical gardens. 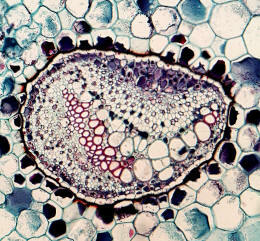 Examine the cross-section of the rachis shown at left, and note the reduced vascular tissue which is composed of a dorsiventrally-flattened central xylem plate, which has phloem tissue on either side of it. The vascular cylinder is separated from the outlying cortical region by a well-defined endodermis and pericycle. This detail shows one of the many small glandular epidermal hairs. Encephalartos belongs to the Cycadophyta within the gymnosperms. They are palm- like plants that appeared about 285 million years ago, near the start of the Permian period, during the age of the dinosaurs. They are truly living fossils. There are 11 genera that contain about 305 recognized species in all. The petiole is photosynthetic, and contains numerous sunken stomata. The petiole and leaf is very fibrous and has large strands of thick-walled fibres just beneath the epidermis. 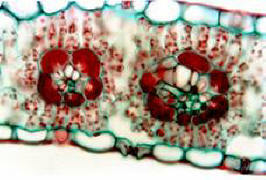 The vascular bundles contain large and small xylem elements and are separated from one another by an endodermis. Cycads exhibit true secondary growth, which is generally described as very slow to "sluggish"! Encephalartos species are generally considered to be slow growing plants. The have many cursory similarities to the larger ferns, but these are gymnosperms. The xylem (X) consists of tracheids and fibre tracheids, and the phloem (P) of sieve cells, albuminous cells and parenchyma cells. 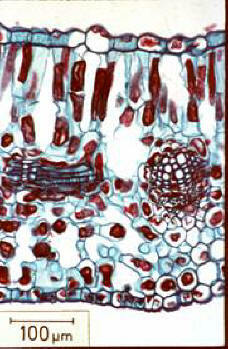 The micrograph to the right, shows the relationship between a group of three vascular bundles in the petiole. Notice that the xylem tends to face towards the common centre of this group. The micrograph below illustrates the fibrous nature of the petiole, which contains hypodermal as well as cortical sclerenchymatous fibers. Question: What role(s) do fibers have in plants? The section to the left, illustrates part of the outer layer of a leaflet. Numerous sclerenchyma fibre strands occur just beneath the epidermis, as well as in the hypodermal region beneath the epidermis. This plant is a gymnosperm. The wood is similar to that of Podocarpus and is composed entirely of long, tapering tracheids, (the files of narrow-diameter pink-red cells) interspersed with which are parenchymatous rays. 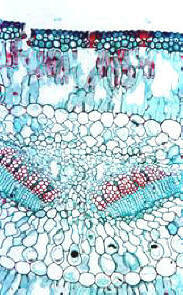 The phloem (not shown in this image) is composed of sieve cells and albuminous cells. The phloem is not organized into longitudinal conduits as in the angiosperms. The micrograph shows a number of primary rays, which traverse the secondary xylem starting in the pith to the left, and running all the way out to the secondary phloem. Question: What is the principal function of a ray? This is an example of an herbaceous dicotyledon stem. This plant belongs to the Cucurbitaceae, which are almost all exploited by man as a source of food. The pumpkins have interesting anatomy, in that most of their stems are hollow-centered and the vascular bundles contain two distinct groups of phloem. The one, the internal phloem, is found on the inside of the water-conducting xylem. It is outlined in blue in the micrograph to the right. The other is called the external phloem, is found on the outside of the xylem. It is outlined in red in the micrograph. The xylem is composed of narrow tracheids and wider-diameter vessels. The phloem within the pumpkin family is composed of companion cells and sieve tubes, which contain sieve plates, which are seen in the micrograph to the right. Question: What material advantage is there to the production of a hollow centered stem? Zea mays is a member of the grasses, and is an important food crop worldwide. This monocotyledonous plant contains vascular bundles that are classified as atactostelic. An atactostele is considered to be the most evolved vascular bundle in vascular plants. The vascular system is composed of individual primary bundles, which are separated by broad zones of parenchymatous tissue. 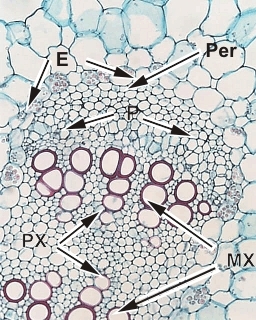 The xylem is reduced in each bundle to usually two large metaxylem vessels, and the largest bundles have protoxylem elements which are usually short-lived, and destroyed during stem elongation. They are reduced to lacunae (cavities) in vascular bundles of mature stems. The phloem is reduced to a few, large-diameter sieve tubes, surrounded by companion cells and associated vascular parenchyma cells. There are many vascular bundles in a 'typical Z. mays stem and nearly all are surrounded by parenchymatous cells. 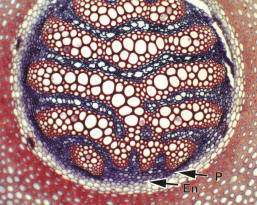 Click here to see a vascular bundle in maize in more detail. Question: Explain why this type of stem is energetically efficient? The epidermis of the submerged stem lacks a visible cuticular layer. The cortex is reduced, immediately beneath which is a ring of vascular bundles. Much of the central region of the petiole is an interconnected airspace, with thin unicellular strands of specialized parenchyma, termed aerenchyma separating the individual airspaces within the stem. Vascular tissue shown in this section occupies the central region of this specimen. Note that there are two vascular strands visible with the two protoxylem regions (PX) facing each other and the metaxylem (MX) is to the outside. The vascular tissue is surrounded by an endodermoid layer (E) (Casparian strips are clearly visible using a 40X objective). Immediately beneath this, is a pericycle (Per). This is an unusual anatomy. Vascularization within leaves is variable, suffice it to say that the veins are classified as major and minor veins, according to relative size and position within the leaf blade. This is an example of a Conifer (Gymnosperm) leaf. Conifer leaves vary from needle-like to rather flattened structures. The pine leaf, of course, is not a leaf in the strict sense, but a needle-like fascicle, in which the base of the needles are wrapped in scale leaves. Morphologically, the fascicles are short shoots within which apical development has been arrested (stopped) - it is thus a shoot of determinate or restricted growth. Needles are thus borne in fascicles on short shoots or spur shoots, surrounded by scale leaves at the base of the fascicle. The Epidermis. Epidermal cells with thick wax and cuticle. The guard cells are sunken and attached to prominent subsidiary cells. Mesophyll. The outer two to three cell layers of the ground tissue are differentiated as a hypodermis and are sclerenchymatous. Many of the remaining cells (mesophyll) of the ground tissue have internal ridges projecting into the cell lumina. These effectively increase the available surface area needed for controlled evapotranspiration. 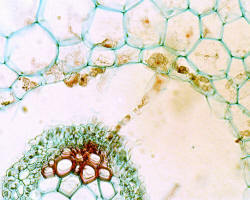 In transverse sections the mesophyll appears compact but longitudinal sections would reveal some prominent intercellular spaces. Most pine leaves contain 2 or more resin ducts, but the leaf you are examining contains several such ducts. Vascular tissue. This pine leaf contains two vascular bundles, which are surrounded by a transfusion tissue. The latter is composed of tracheids and parenchyma cells. The transfusion tissue is surrounded in turn, by a conspicuous endodermis, the innermost layer of ground tissue. The endodermal cells in your slide have somewhat thickened walls, especially the outer tangential wall, which contains conspicuous simple pits. At one time these endodermal cells contained a well-developed Casparian strip. 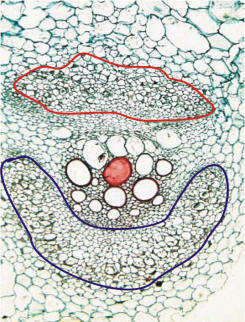 Each vascular bundle contains a vascular cambium. Some secondary xylem and secondary phloem has been laid down. This leaf can be described as a 'typical mesomorphic leaf. Examine the micrograph to the right, note that the upper part of it contains long columnar palisade cells. The vascular tissue appears in the mid region, and sits on top of a spongy mesophyll. Can you see any stomata in this section? Note: The smaller bundles are embedded in the mesophyll, but each is surrounded by a bundle sheath. Note the position of the xylem and phloem within the bundle. Some of the bundles are seen in TS, some in LS, and some are oblique - why is this? There are three sizes or orders of vascular bundle in the maize leaf - large, intermediate and small bundles occur within the lamina (blade) of the leaf. This is typical for many of the monocots. Notice that the mesophyll contains small red coloured objects. These are chloroplasts, that carry out the first stages of photosynthesis. Carbon dioxide is trapped by maleic acid within the Kranz mesophyll and is transferred to the bundle sheath via plasmodesma, where the malate is released, and taken up into the Calvin Cycle where the CO2 is incorporated into sugars. Because the first product formed during photosynthesis is a C4 acid, this cycle is called C4 photosynthesis. C4 photosynthesis is much more efficient than C3 photosynthesis. Several anatomical features are commonly used to distinguish C4 from C3 plants. The common ones are listed in the text that follows below. Try to identify as many as you can in this micrograph. The most notable of these features is the presence of a bundle sheath surrounding the veins in the leaf, which usually contain large, conspicuous chloroplasts. Note that the mesophyll radiates round the bundle sheath - it looks wreath -, hence its German-origin name, the Kranz mesophyll. 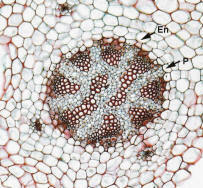 A diagnostic feature which can be used to separate monocot from dicot foliage leaf, is that when viewed in transverse section (i.e. such as the section plane in the image above) all the veins in monocot leaves are cut in transverse plane, whereas typical transverse sections of dicots will have veins which are mostly cut obliquely. Can you work out the reason why this should be so? 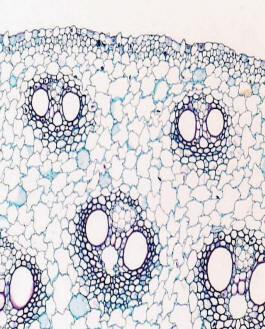 Most monocot leaves have groups of large, swollen epidermal cells, interspersed with smaller epidermal cells. These large cells are called bulliform cells. 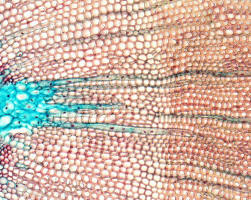 The image to the right, shows a series of bulliform cells in the adaxial epidermis of Zea mays. Note also, the solitary stomate and its associated guard cells. These bulliform cells have a significant role in the life of the plant, in that in times of water stress, the bulliform cells loose water, allowing the leaf to roll up. This results in a smaller evaporative surface area being exposed to the atmosphere and as a result, a lower rate of transpirational or evaporative water loss.